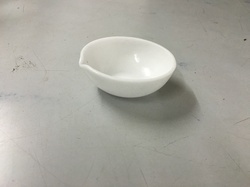 Silica Crucible is used for metal casting. Our silica crucibles are of different sizes and dimensions. Our silica crucible can be used for all ordinary purposes. We provide best quality silica crucible which is completely unaffected by all halogens and acids. Capacity: 15 ml, 25ml, 50 ml, 80 ml, 100 ml, 150 ml, 200 ml. Silica Crucible are used in research, industry and education available in 25 ml, 50 ml, 80ml and 100ml. Low form, glazed inside and outside, translucent, with lid. With thorough understanding and expertise in this domain, we are instrumental in presenting an optimum-class variety of Silica Crucible and Lid. Presented products are made-up by employing supreme-grade factory material altogether with cutting edge tools and technology in adherence with the predefined quality guidelines. 11. 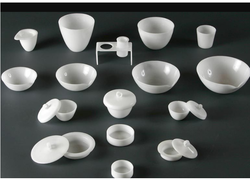 904 silica crucibles, “laboglass, without lid, withstands 800°c.